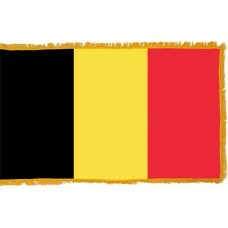 On January 23rd, 1831, the current Belgium Flag was adopted in its current form of vertical stripes of black (nearest the pole), gold, and red. Originally when the country gained independence from the Netherlands in 1830, it sported horizontal stripes but its current flag is modeled after the French flag. The colors on the Belgium Flag evolved from the former coat of Arms of the Dutchy of Brabant, a state of the Holy Roman Empire between 1183 and 1430. The coat of arms featured a gold lion against a black background with the lion's tongue and claws appearing in red. Each color of the flag represents one element of the coat of arms. Brabant covered the areas of the three modern Belgian provinces of Flemish Brabant, Waloon Brabant and Antwerp. An extra sign of Brabant's importance to the Belgians lies in the name of the country’s National Anthem – "La Brabanconne". Perhaps surprisingly for such a small country (it is about an eighth of the size of the United Kingdom), Belgium has seen numerous epic battles on its territory. Most people will be familiar with how Napoleon was defeated at Waterloo in 1814 by a coalition of British and Prussian armies. 100 years later saw another bloodbath inflicted by the Germans at Liege when they secretly developed the "Big Bertha" gun which practically wiped out Fort Loncin which was intended to be the mainstay of Belgium's defense. 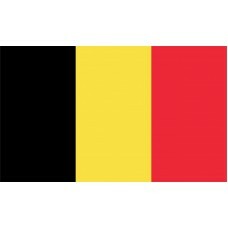 Throughout its history Belgium was fought over by many different countries. It has been governed at different times by the Gauls, the Celts, the Romans, the Spaniards, the Austrians, and the Dutch. In its modern form as an independent state it has two ethnicities: the Northern Flemish part where a dialect of Dutch is spoken, and the Southern Walloon part where French is spoken. Many, but not all, Belgians are bilingual. It is interesting to Belgians seeking directions or information from a stranger. They will cautiously check out in which language to address the other person. "Neerlandais?" "Francais?" Although there is some tension between the two ethnicities, the country operates a remarkably bilingual Parliament. Like the United States, the Parliament has two houses. The Belgian Federal Parliament consists of two governing bodies: the House of Representatives and the Senate. A Parliament is now the mainstay of the Belgian economy. The EU's Parliament being in Brussels results in a vast quantity of highly paid officials living and working in and around Brussels. They certainly provide a boost to the local economy with the resultant need for housing, schooling, food, heating, and social amenities. Despite its fertile soil and green pastures resulting from high levels of rainfall, agriculture only accounts for less than 1% of the economy. Approximately 21% comes from industry and the remaining 18% or so from the service industries. This is aided by the Belgian's excellent transportation infrastructure which consists of roads, railways, and ports. You, our hearts and our arms, we give.